As discussed in our prior post, Hingham’s Unbuilt Highways, Part 1, traffic has been an issue for the Town of Hingham for nearly 100 years. This has been particularly true for Main Street. Each time the State proposed a plan to solve the problem, though, concerned citizens have stepped forward to oppose what they saw as a threat to the town’s character. When Route 128 was extended into Hingham (heading to Nantasket Beach) in the late 1920s, increased complaints about traffic on Main and East Streets led the State, by the mid-1930’s, to promise a bypass route for traffic relief. The route that it proposed followed Gardner Street, starting at Whiting Street, crossing Main Street, and eventually turning north through the less developed eastern part of town into Hull. Funding issues stalled any actual construction, however. In 1938, the State offered a “temporary fix,” offering to build a rotary in Hingham Centre at the intersection of Main, Short, and Middle Streets. 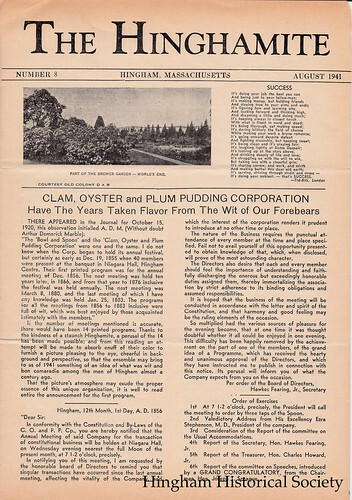 As reported in August 1941 issue of The Hinghamite, the rotary plan, which probably would have resulted in several historic buildings being torn down, was halted by the efforts of Mrs. David T. Whiton and Miss Ethel H. Studley, owners of some of potentially effected properties. They gathered a petition of nearly 250 names and packed a public hearing which convinced the State to back down. The Town did agree to better signage, more traffic islands, and other measures to help ease traffic problems. The State’s proposal was an 8-mile, four-lane expressway (250 to 400 feet wide) from Route 3 to George Washington Blvd. in Hull. According to the State, this would fulfill three specific goals: to stimulate residential development and recreational activities for the towns along its route, to provide traffic relief to local streets, and to provide safety, comfort and reduced travel times to motorists. The State offered three alternatives for this proposed expressway’s route through the southern and middle parts of Hingham. The “Gardner Line” alternative began at an interchange with Route 3 in vicinity of today’s Derby Street Shoppes, taking the route across Whiting Street and south of Gardner Street, across Main Street then turning north in the vicinity of Prospect Street. The two other alternatives, the “Pond Line” and the “Webster Line” started at Route 3 in Norwell and ran north to Prospect Street. From Prospect Street, all three proposed routes proceeded north along a “Common Line” running parallel to the border of today’s Wompatuck State Park. North of Free Street (where an interchange was planned), three alternative routes were again proposed north to Hull. Two of these proposed routes, the “Western” and “West Central” Lines would have required “relocating” Triphammer Pond and the Weir River. The “Eastern Line” would have run east of Triphammer Pond but would have skirted Turkey Hill. All three proposed routes intersected with Route 3A (with a large interchange) at between Summer Street and today’s Weir River Farm. Any of the alternatives would have condemned 17 to 26 houses and requiring those living in them to move and would have cost $12 to $15 million (in 1968 dollars). Many Town officials were receptive to the plan, provided that the State chose one of the Norwell routes. The Selectmen even asked the State to add an interchange at Rockland Street in the event the Eastern Line was chosen. In the spring of 1968, however, Norwell rejected the proposed routes within its borders due to their proximity to the municipal water supply, and the State indicated that the Gardner Line would probably be its recommended southern alternative. At a Special Town Meeting held on September 30, 1968, Hingham voters rejected the State’s plans by a narrow vote of 559-506. (A second article, requiring the Selectmen to insist upon the Pond-Common-Eastern Line configuration if the State moved forward with a highway despite the Town’s vote, passed 422-231). Since neither Norwell nor Hingham would approve a southern route through their respective towns, no construction was started. By the early 1970s, with continued opposition and with overall sentiment for expressway-building waning in the metro Boston area waning (a trend exemplified by the cancellation of the Southwest Expressway in Boston), the State abandoned the plan. Continued traffic problems on Main Street, however, revived the idea of building a relocated Route 228 in the early 1990s. Several frustrated Main Streets resident asked Selectmen to reconsider the State’s 1960s plan. This time, however, a large majority of town citizens and the town’s officials stood up against this idea. Their sentiments were best summed up in a letter which John P. Richardson wrote to the editor of the Hingham Mariner on August 8, 1993, arguing that any such highway would ruin one of the town’s gems, Wompatuck State Park. Letter to the Editor of the Hingham Mariner, written by John P Richardson on August 8, 1993. This entry was posted in Uncategorized and tagged automobiles, Gardner Street, Highways, Hingham, Hull, John Richardson, Main Street, Norwell, Route 128, Route 228, transportation.